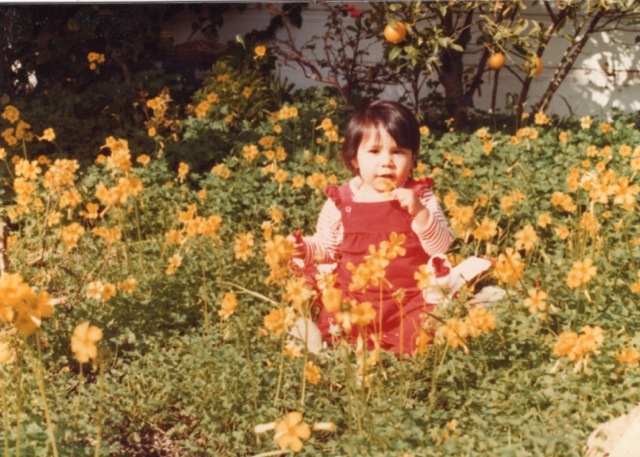 This picture, from April 1977, is one of my favorite pictures of my Mom. I don’t know much about the background of this photo. I don’t know where she was. I don’t know what she was doing at this beautiful beach. I don’t know who the other person in the picture is. I don’t know what she was thinking about at the moment this photo was taken. I don’t know…and I will probably never know any of those things. Today is the three year anniversary since my Mom died very suddenly on a Wednesday morning. I miss my Mom every day. I miss her love and support. I miss how she was a wonderful grandmother to Reya. I feel really sad that she never got to meet Lola. But one of the things I miss most of all is not learning more about who she was before she had kids. I miss not learning more about pictures like this one. I want my daughters to know who I was as their Mother but also who I was as a child, as a teenager, as a young woman. My Mom’s sudden passing is one of the BIG reasons that I started scrapbooking. I had dabbled in scrapbooking before but after losing my Mom I knew that I had to start documenting the stories and pictures of me and my family. So today and throughout the month, in loving memory of my Mom, on this three year anniversary I’m participating in 34 Things with Jennifer Wilson at Simple Scrapper. Over the next three weeks I’ll be sharing 34 Things I want my daughters to know about me. Some may be just little things I remember, some may be experiences I’ve had, and some may be feelings I’ve felt over these past 30 years. The point is, that everything on this list is documented and is the start of a long list of stories about myself I can share with my daughters. 1. I was born in San Luis Obispo, CA in 1982. My Mom and Dad went to Cal Poly SLO and I think they enjoyed the small college town feel of San Luis Obispo. My Grandpa Mago always told me that whenever they visited I always said “I want to go Downtown”, with extra emphasis on the “own”. We lived there until I was almost three then moved back to Southern California to be closer to our family. As soon as I saw this class I knew this was just what I needed to get my own growing-up pictures AND stories into an album. If completing a scrapbook about yourself is a goal you have, I think this class may be a great choice. To learn more head over here and definitely check out the video. Even more exciting, Jennifer is doing a giveaway! For those participating in 34 Things, you have a chance to win a seat in Before Your Story. Go here to learn more. Thanks for starting this short story-telling journey with me. Come back next Sunday to see more of the 34 Things I want my daughters to know about me. What do you want your children or loved ones to know about you as a youth? Let me know in the comments. Gosh, your mom was so lovely. I’m really proud of you for celebrating her and your own stories. Thank you for reading Jennifer and also for providing the 34 Things idea. I’m glad I took a chance at sharing this and am so grateful for your support. 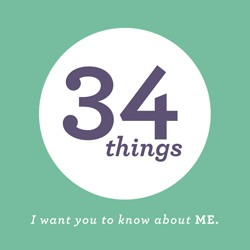 I’m totally in this 34 things. Hopefully I can look into it tomorrow. But… Why 34? Thanks for reading Ana. It’s a great idea and I know you’d be great at sharing little stories about who you were as a young woman before little Evan came along. The 34 was started by Jennifer Wilson at SimpleScrapper.com to honor her own list of 34 Things for her 34th Birthday. Marina I love this idea of sharing what you were like before you had the kiddos. It definitely makes me think and want to get to know my mom and grandma more! This picture, looks exactly like you! I love that photo of your mom, I met her the following year when your Uncle Ricky and I started dating. Wow! Thanks for sharing Marina. Your mom was a hottie! I have never thought about scrapbooking about myself. I am going to give that some thought. Of the 100s of scrapbook pages I have created I can only think of one that was just about me. Yes scrapbook about yourself! Even if its only a few of your most important stories. Your boys, while they may not be into scrapbooking, will care about the stories you, their Mom, have to share. Thanks so much for reading Nikki! Nice job Marina! I miss her as well, she was a great sister-in-law! My the way Potted Meat on soft white bread is still the best sandwich along with the likes of bologna and sardines. I can’t imagine what it is like to have lost your mom. I’m sure you miss her more and more as you journey through parenthood. Thank you for sharing something so personal and emotional. I love that you are giving your daughters the opportunity to know so much about you. I love the ideas and would like to look into joining in on the scrapbooking activities! Thanks for reading Shannon! I should try to figure out a local scrapbooking plan for us Moms, there are more than a few who want to learn more or get started. WOW! what a great tribute for your mom and great living memories for your daughter. This idea floats in and out of my mind. I guess I never thought about my daughter having any questions about me. Great post! popping over from Facebook and one little word. group. Its funny that when we’re younger we don’t think about our Moms as they were before they were our Moms. This was true for me. Even if your daughter doesn’t wonder about you yet she likely will one day. That’s what I’m hoping for my daughters anyways. Even our One Little Word layouts will provide them with a snapshot of our feelings and lives as they were in 2014, which I truly believe will provide inspiration to them as they become young women. Thank you so much for coming over to Heartmix. Marina, this is very touching. My condolences and prayers to your mother. She was a lovely young lady and I am honored to have held her hand. Your daughters, family and friends are blessed to have such an inspiration in their lives. This scrap booking idea is great and I also want to take part. I’ll just leave my wild, censored photos out of it. Lol. Love and blessings, Ali Kia. Thanks for reading Ali and thanks for your support during what was a very tough time. Looking forward to making more memories with all our little girls in the Kia family. I love this post for two reasons: the use of a photo that, although you don’t know the story behind it, you were able to use it to tell your OWN story… and the 34 Things concept. I read about this on Jennifer’s site, but you’ve inspired me to revisit it. Thanks for reading! Just posting this picture has prompted family members to share what they know about it so this post has been cathartic in more ways than one. Glad I could provide some inspiration for you. I’m a big fan of Jennifer’s Simple Scrapper site, its been a big motivator in my scrapbooking over the past year. This is really a great idea and beautifully written marina! It’s important to know that we are the historians for future generations so finding a way to document little pieces of you life so those little girls can better know about where they came from is a beautiful idea. You’re one of the best moms I know. Keep up the good work! Thank you Maryam. I am so grateful for you and all of the family’s support and you aren’t lazy you are a busy working mama! Thank you so much for reading. Did your Mum ever go to New Zealand? This sooo looks like the ‘Pancake Rocks’ area of the South Island. Allie thank you for reading. No she never visited New Zealand. (I would love to though.) 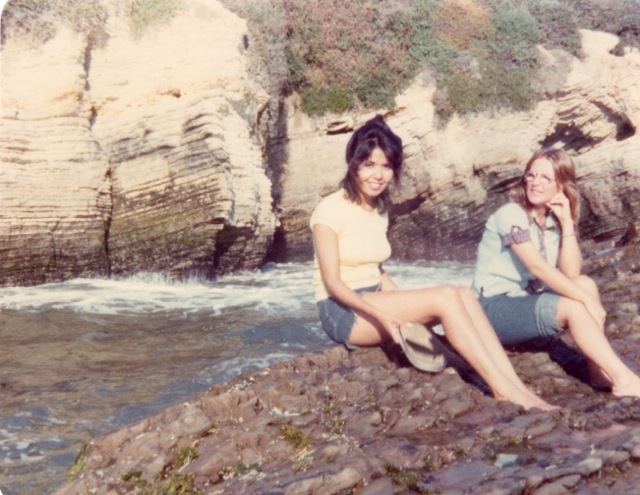 After I posted this my Dad shared that the picture was taken at Montana Del Oro which is very near to San Luis Obispo in the Central Coast of California. They have been divorced for quite a long time so I never thought to ask him about it. Being vulnerable is so hard but this post has really proven to me that people are so supportive when you share your heart with them. Thank you for coming over to Heartmix. Beautifully written Marina – such a lovely thing to do for your family and a celebration of your Mum.